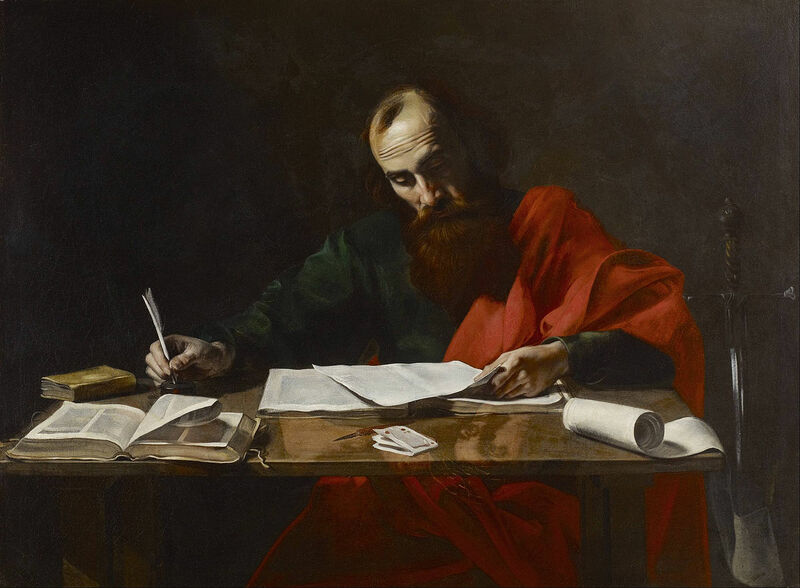 St. Paul teaches that salvation is achieved through God and a person working together. Salvation comes from God alone (Catechism of the Catholic Church, paragraph 169), but is not achieved by God alone. The person must respond to God’s offer by accepting God’s invitation to dwell in and work through the person. Jesus clearly and repeatedly taught that salvation is obtained by participating with God. For example, in Mark (10:17-21) Jesus tells the man who asks what he should do to achieve salvation to follow the commandments, sell what he has, give the money earned from the sale to the poor, and come, follow Him. Each of these requires an action (work) on the man’s part – follow the commandments, sell what he has, give the proceeds of the sale to the poor, and come, follow Jesus. Salvation comes to a person from accepting God’s invitation to dwell in and work through the person. For example, Paul teaches (Galatians 2:20), “And I live, now not I: but Christ lives in me. And that I live now in the flesh: I live in the faith of the son of God, who loved me and delivered himself from me.” Paul further writes (2 Corinthians 6:1), “Working together with Him, then, we entreat you not to accept the Grace in God in vain. This entry was posted in Uncategorized and tagged 2 Corinthians 6:1, Catechism of the Catholic Church, Catholic, Catholicism, Christian., Christianity, Galatians 2:20, Mark 10:17-21, Salvation, St. Paul, Works. Bookmark the permalink. An observation: The requirement to obey the Commandments certainly applies to all, for these are prescribed throughout the Old and New Testaments, and the substance of these commandments is found in every human mind in the form we call Natural Law (Catechism, 1954-60, esp. 1955). The exhortation to sell temporal possessions does not, I think, strictly apply to all, but only to the man with whom Christ was speaking, and, by logical extension, to others who, like him, think that eternal treasure is attained by the same means as temporal treasure. Perhaps this misunderstanding can be heard in his opening question: “What must I do to INHERIT eternal life?” (Mk 10:17) The mentality that drives some men to obtain more temporal wealth than is reasonably necessary often prevents them from following the spirit of the Law, even though they obey the letter of the Law. Thus, Christ goes on to lament how difficult it is for the temporally wealthy to enter heaven (v.23). Thank you for an interesting post on this important pericope. God bless! Saintly Sages — Thank you for observation/comment, it is greatly appreciated. I did not mean to imply that we must sell our possession to attain salvation. We must, however, respond to God’s invitation, salvation requires an action on part to the invitation — many parables are constructed around the response, or lack thereof, to a sent invitation. But, that can be a topic for another posting. God Bless!